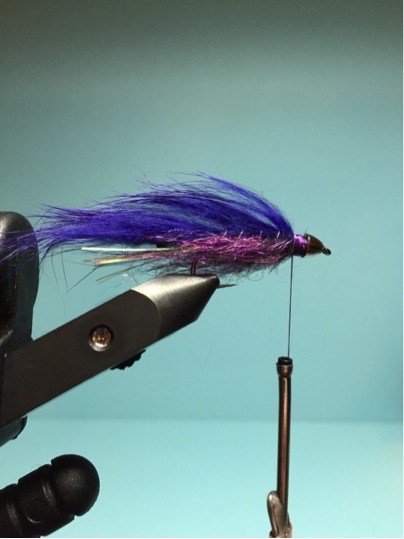 Materials: Allen S402BL 6-10, UTC 140 Purple, Nickle Cone 3/16”, 0.020 Lead-Free Wire, Silver Wire, Flashabou Orange/Pearl and Pearl, Purple Rabbit Zonker 1/8” and Arizona Simi Seal Black/Purple. Place the cone on the hook and wrap enough lead to cover 2/3 of the hook shank when pushed into the cone. Secure the lead to the hook and wrap back to the start of the bend. Tie in 3 strands of Pearl and 3 strands of Orange/Pearl Flashabou. Fold them back and secure them in with wraps giving you 12 strips total. Trim off the excess so that the flashabou is the same length as the hook shank. Tie in the silver wire. Tie in the rabbit zonker so that the hairs extend past the flashabou by about half the length of the flashabou. Generously dub the Simi Seal in a counter clockwise direction so that the fibers pull out nicely when it’s teased out. Wrap all the way to the cone head. Pull the rabbit zonker over the back and secure it down with 5 turns of the silver wire. Use a bodkin to pull out all the hairs that were locked down by the wire. Secure the rabbit zonker with thread wraps leaving a gap between it and the cone. Use a piece of Velcro or dubbing brush to tease out the dubbing and brush it backwards. Cut 2 small pieces of zonker to be tied in at the 4 & 8 o’clock position, relative to the top piece at 12 o’clock. Cut them short enough so that the hide of the zonker will not foul up on the hook point. I usually cut a piece that measures from the back of the cone to just shy of the hook point along the shank. Generously dub you tying thread and fill in the gap that we left between the cone and zonker strips. Use Velcro or a dubbing brush to tease the fibers and brush them back. Whip finish and you’re done. Tie these in all colors and sizes. I fish these on the swing and strip, or strip and pause in still water. It will put the hammer down on pellet heads.